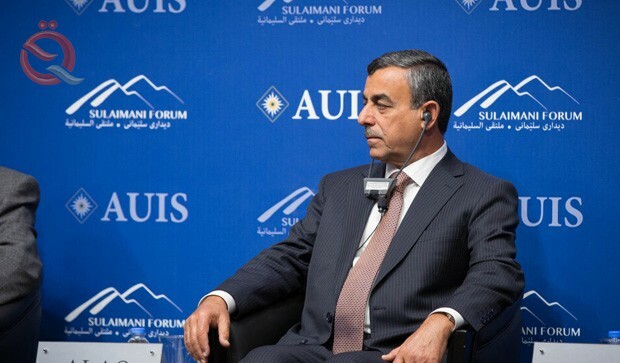 The Secretary-General of the Council of Ministers, Mahdi Al-Alak, on Thursday, the importance of the implementation of the draft labor force survey and its impact on responding to the requirements of the labor market. 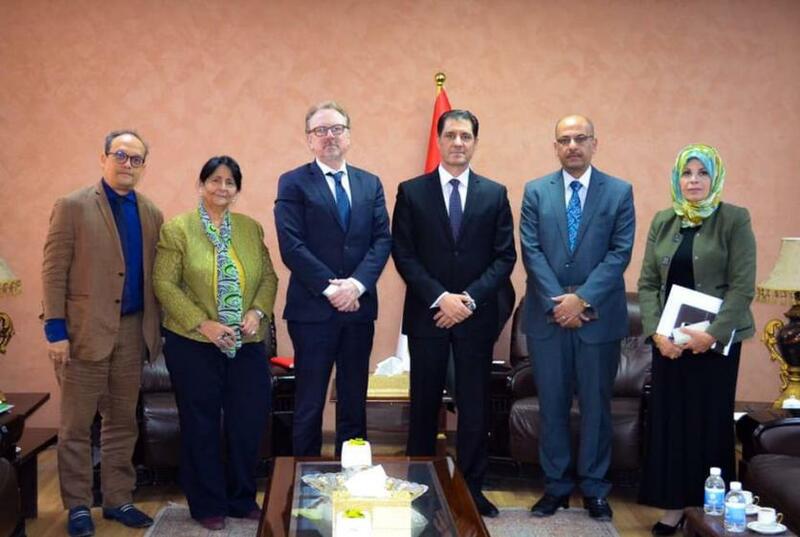 The Secretariat of the Council of Ministers said in a statement received by the "Economy News" a copy of it, that "the relationship met the delegation of the International Labor Organization in Iraq, represented by Frank Hagman, Deputy Regional Director / Director of the Decent Work Team, and a number of technical team represented by regional advisers. 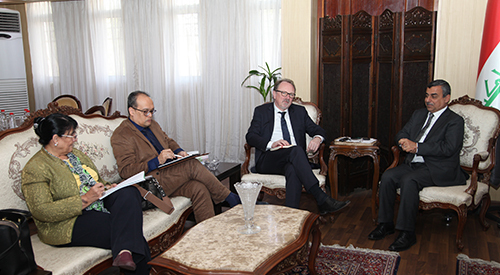 "Hagman has been briefed on the status of the Decent Work Agenda and technical activities to be implemented by the Organization in the coming months and in cooperation with the Ministry of Labor and Social Affairs, other ministries and some United Nations agencies following consultations in the third quarter of 2018, Which will be funded by the Organization from its core budget in partnership with the Iraqi Central Bureau of Statistics, which will contribute to the development of a new employment policy in support of the government's efforts to achieve the goals of sustainable development. "Hagman provided a detailed summary of their work in coordination with United Nations agencies and organizations concerned with displaced people in the liberated areas, as well as their immediate work and at the request of the Iraqi government to incorporate the Private and Public Social Security Act." The Minister of Planning, Dr. Nouri Sabah al-Dulaimi, received on Wednesday at the Cabinet's office Mr. Frank Hagman, Deputy Regional Director of the ILO's Office for Arab States, and his accompanying delegation, during which they discussed possible ways to develop and support the Iraqi private sector. Office of the Organization in Iraq. strategic plans of the Ministry aimed at giving the private sector the opportunity To ensure that the Ministry works on the development of economic and administrative policies and the establishment of a fair employment policy aimed at achieving social security for all. Dr. Dulaimi called on the International Labor Organization to support the capacity of the Central Bureau of Statistics with regard to the implementation of the census, conducting field surveys on the informal labor market, and updating the classification guide, according to the changes witnessed by the Iraqi labor market in recent years. Mr. Hagman confirmed that he arrived in Iraq at the head of a high-level technical team to discuss the best ways to support the Iraqi government in its development plans aimed at developing the working environment and empowering and rehabilitating youth capacities. The Secretary-General of the Council of Ministers d. Mahdi Al-Alaq stressed the importance of implementing the labor force survey project and its impact on responding to labor market requirements by collecting statistical data on the problem of unemployment in order to develop plans and find sustainable solutions, as well as supporting the private sector as a guide for this development through encouraging investment. This came during his meeting with the delegation of the International Labor Organization's mission in Iraq, represented by Mr. Frank Hagman, Deputy Regional Director / Director of the Decent Work Team, and a number of the technical team represented by the regional advisors. Mr. Hagmann briefed the Secretary-General on the status of the Decent Work Agenda and technical activities to be implemented by the Organization in the coming months and in cooperation with the Ministry of Labor and Social Affairs, other ministries and some United Nations agencies following consultations in the third quarter of 2018, Of its core budget in partnership with the Iraqi Central Bureau of Statistics, which will contribute to the development of a new employment policy in support of the government's efforts to achieve the goals of sustainable development. Mr. Hagman also provided a detailed account of their work in coordination with United Nations agencies and organizations concerned with displaced persons in liberated areas, as well as their work at the request of the Iraqi Government, incorporating the Private and Public Social Security Act.